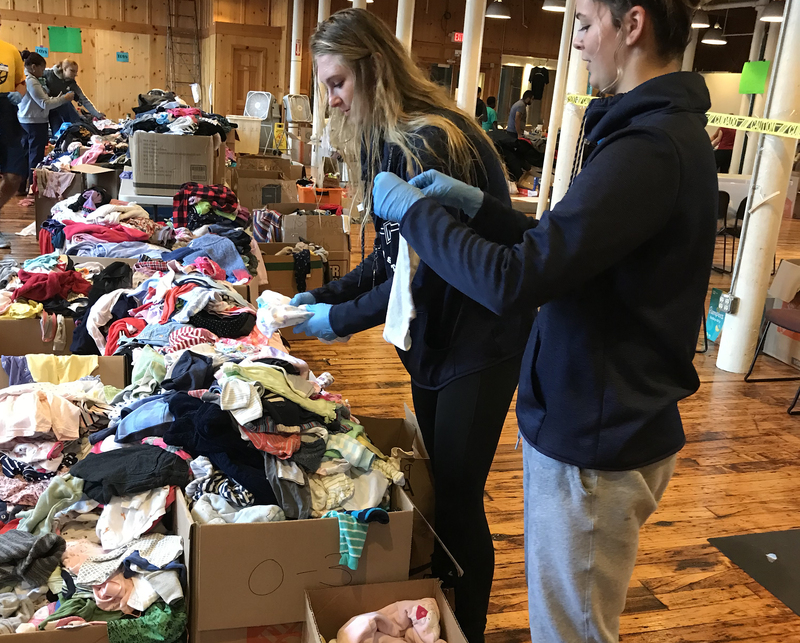 Students at Merrimack College have participated in multiple donation drives and volunteer activities following explosions and fires throughout the Merrimack Valley on September 13. Hands to Help collected personal and household items while providing childcare services, and members of the women’s basketball team sorted through donations before they were distributed to those in need. Merrimack also invited first responders and community members to a BBQ on campus. Overpressurized gas lines in Lawrence, North Andover and Andover caused the explosions and fires throughout the area. This resulted in multiple injuries, the displacement of most of the residents in the three areas and the death of one Lawrence native, Leonol Rondon. First responders came from all over the area to help in this time of crisis, including Billerica, Chelmsford, Lowell, Boston, Cambridge and southern New Hampshire. They worked non-stop for a few days putting out fires and helping maintain the overall safety of these communities. Merrimack College also took steps to keep their students safe by sending out constant updates on what was occurring with the gas lines and power on campus. A brief evacuation of campus buildings occurred while gas was shut off as a precautionary measure. Campus leaders urged students that were still on campus to leave if they were able to and provided safe spots across campus for students who were unable to leave. Residents in the area of the explosions and leaks were asked to evacuate to somewhere safer until the situation was under control. This was made difficult by the fact that the root of how the leaks started was not immediately apparent to first responders or government officials. Businesses were also forced to shut down during the incident and continued to be closed until it was deemed safe to reopen. Many are still without gas while others remain displaced from their homes. While most everyone was able to make it out of the affected areas unharmed, over a dozen people sustained injuries and Rondon was fatally struck by debris while waiting in his car outside of a friend’s house. A couple of Rondon’s friends were with him in the car and were severely injured by the debris. The Lawrence Senior Center is currently collecting hand sanitizers, alcohol pads, socks, underwear, blankets, toiletries, feminine products, toilet paper, paper towels and ziplock bags. The Massachusetts Society for the Prevention of Cruelty to Animals-Nevins Farm in Methuen has mobilized an emergency staff and phone number for any animals in affected towns who need shelter as a result of the explosions and fires. Nevins farm is also in need of supplies, such as microchip scanners, paper towels, dry cat food, canned cat food, canned dog food and cat litter. North Shore-Merrimack Valley Relief Fund is a regional relief fund established by the Cities of Beverly, Lynn, Peabody, and Salem. Those who wish to donate may do so by visiting any Eastern Bank location and donating over the counter. An online donation option will be available at www.salem.com by early next week. Groundwork Lawrence is directing all donations this weekend to the Lawrence Gas Relief Explosion Fund www.groundworklawrence.org/donate. Massachusetts Red Cross is helping here and also with Hurricane Florence www.redcross.org/local/massachusetts or call 1-800-Red Cross. MA Salvation Army can be reached at www.massachusetts.salvationarmy.org or call 339-502-5900. The Lawrence Senior Center at 155 Haverhill Street is aggregating donations of goods that include everything from blankets and pillows to toiletries and diapers. Donations can be dropped off or you can contact them directly at 978-620-3550 to coordinate a drop-off.